How did you start out as a colorist? 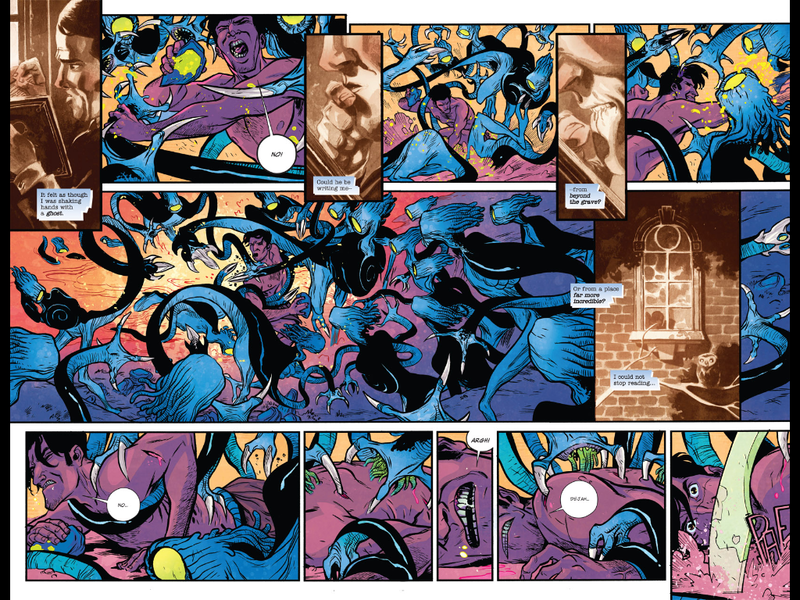 I began my career as a colorist when I met Declan Shalvey—he is the artist right now on Injection and Moon Knight. He and I met each other in New York City, and we were walking down the street, I had just graduated art school, and he asked me what I wanted to do, and I said I wanted to be happy. He said, “that means you’re aimless”, and I was like, “what ?” I had no money, I was very poor, and I wanted to work in comics, but I used to draw, I majored in illustration… but I didn’t feel good enough, especially after meeting Declan Shalvey. When you see what sequential artists really have to do—I was like, I can’t draw a bike at the drop of a hat, I can’t draw a house, just because someone’s like “draw a house”. So he said, “have you considered coloring ?” and I thought, “you can color comics?” I never even thought that was… you just don’t consider sometimes the whole process it takes, like lettering, coloring, penciling, inking… So I thought, “I’ll try it”, and so I sent some test pages in, and I actually had my first job with Stephen Mooney, who draws Half Past Danger, and we did a very short small story together for Angel, the Whedonverse comic, and that was my first. And after that, I just kept getting more and more job offers—because of my illustration background, I knew a lot of great illustrators, like Chris Samnee, Tom Fowler, Ramon Perez… I knew them from when I was in college, and they liked my drawings, and they thought “your coloring now? Hey! We should work together!” And that was how I took off! I was very lucky, but I think it came from an illustration background first. What’s a day in the life of Jordie Bellaire like? What are the different steps in your working process? So after that, after I have my brain moving, I like to send all of the artwork to a flatter—a flatter is someone who separates all the line art into different color shapes—and then when I get it back from my flatter, I take it and I color-correct it to basically look like—because flatters normally are just basic separations, so it’ll be like… one time—you know who Rocketeer is, right?—Rocketeer, I once sent it to my flatter and when they sent it back, they had him all wearing black, like he looked like Darth Vader. Obviously Rocketeer doesn’t wear all black. So I color-correct it, and then I color it and I render it, and then I flatten it, and I send it off for approvals—approvals are very important to me! I think some colorists don’t care whether their artists like it, but it’s very important to me, that an artist is happy… I mean, maybe probably because of course my boyfriend is an artist, then also I was an artist, I care a lot about an artist being happy. Then after the artist gives me their approval, and the writer also gives me their approval, then it’s done, and then it gets lettered, and it’s basically that! Do you work the same way with all publishers, or do you have to adapt? Definitely, each project is a bit different, I would say by publisher? With Image it’s kind of all Wild Wild West, because no one has an editor really, and everybody is a bit different, so collaborative processes are kind of just different… I would say some are more… choppy. Some are like a well-oiled machine—me and Declan, we work together on Injection: well-oiled machine at this point, because we did all of Moon Knight with Warren [Ellis], and now… my goodness, I think me and Declan have done… because we also did Deadpool… so Injection is just a breeze. 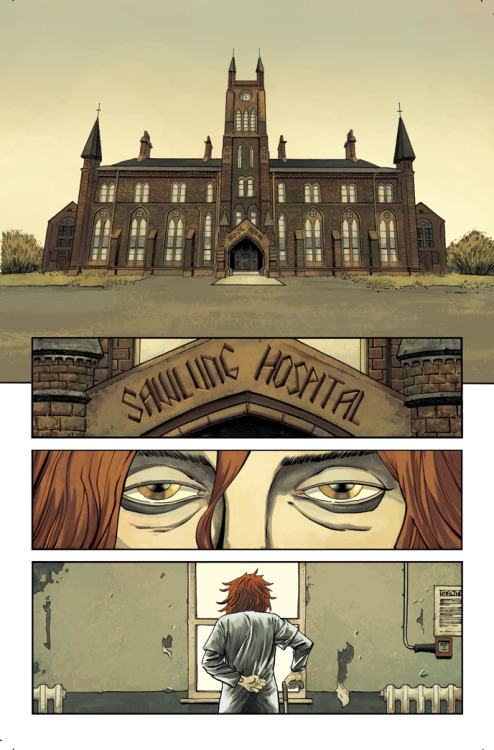 Something like They’re Not Like Us, with Simon Gane, written by Eric Stephenson—also a total breeze, I think because we all just click, when we came together, none of us had worked together before, but that first issue just liked clicked, right into place. But then there’s other things that, maybe at a publisher I’ll do, and you have to work through the editor, so I’ll send the colors separately to the editor, and then the editor has to separately send it to an artist—I don’t usually like such a weird interruption in communication, because, again, I like to speak directly to the artist—so that’s probably the worst way I have to adapt, that’s the weirdest hurdle in the way of different editorial teams, the way it works. Can’t think—I’m trying to think of another book that’s breezy… Pretty Deadly as well, Pretty Deadly is super-breezy, we’re working on the second volume, coming out this fall, and we just did some preview pages together, and we haven’t worked together in like, a year—I was a little worried, because now we do have an editor, so I was kind of like… well we have two editors, sort of, now, we actually did have one [Sigrid Ellis] before… but I was like, “oh, I’m so nervous, I hope that it doesn’t, like, gunk up the process!” But it was amazing, it was just, like, organic again. I sent all the pages, I’m approved, she’s happy, I’m happy, we’re all happy—it’s done. That’s magic. 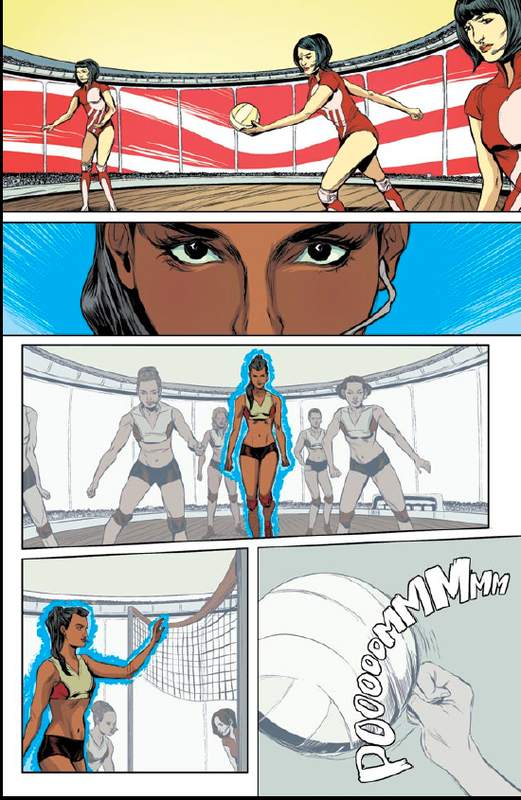 When comics work like magic, it’s the best. Any idea how many books you’ve colored so far? How do keep working on so many books simultaneously? 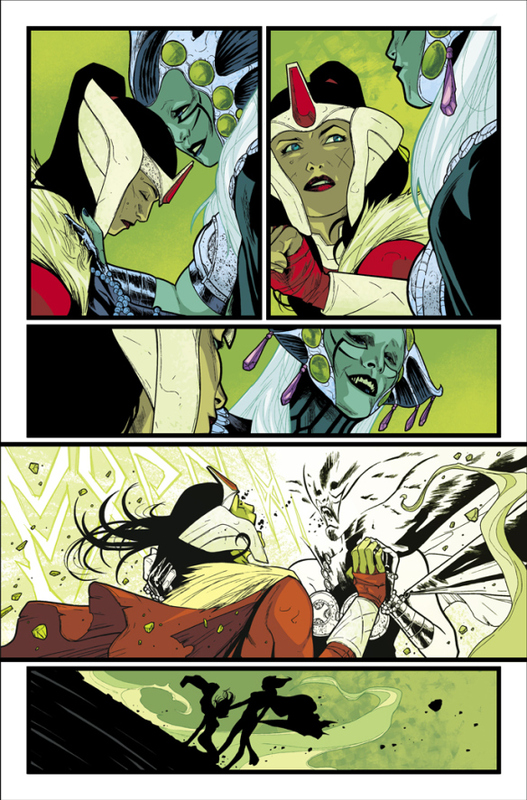 In my career, I’ve been coloring for about… four years, I think, now? I would say too many. I don’t know how many. I don’t—I honestly can’t count off the top—a lot. Um… I’d say at least a hundred, maybe more, two… maybe two hundred, I’m not sure different appearances—I mean especially if you count my cover work separately from interiors, I mean, it’s just a lot, I’m sure it’s a lot. Each month, I normally color between ten and twelve titles—which I don’t normally tell people, I normally keep it a secret, but… it’s hard, but some books are easier than others, and some books are so… I-I just don’t have a life. 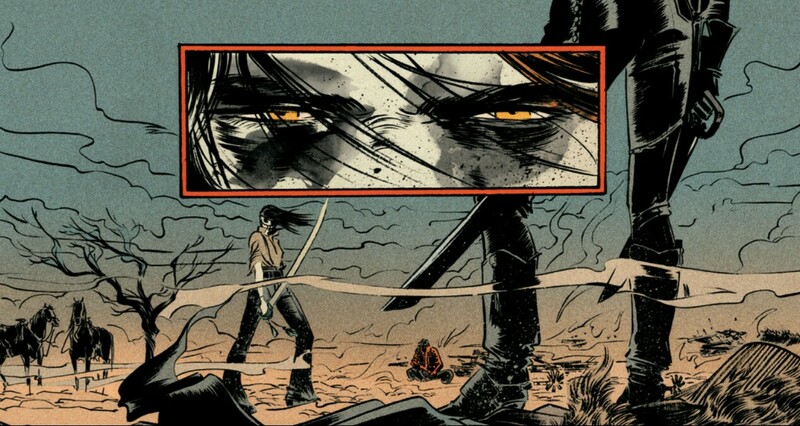 I sit at home and I color, this is pretty much my life, like every day of the week, but that’s worth it, because I love all my books I’m on right now, I’m very passionate about, like, Injection and Pretty Deadly and They’re Not Like Us, stuff like that. But yeah, I’d say, if you take twelve books a month, maybe, and multiply that by twenty-four, that’s what I do in a year. On a good year—like, sometimes it’s worse, because I do even more, so… Never less. So, it’s busy. What can you say about the “Comics are for everybody” initiative, which you started? Any idea how well it was received? I don’t know if I should be saying this, but I’m going to: I recently was speaking with Eric Stephenson, the writer of They’re Not Like Us and Nowhere Men [and Executive Director at Image Comics], about Comics Are For Everybody, because Image was a great supporter as well—even though it’s its own thing, we wanted to make sure it wasn’t linked to any particular person, it was just meant to be a message—Image will be adopting it for the future. So that’s great; so Image will now be in charge of distributing it, and it’s also still going to have some charity linked to it as well—we’re not sure of the charity yet. But I’m very excited, because I think Image is a really happening publisher, they really know what’s up, and with them backing up that message, I just think it’s going to be great, I’m really looking forward to Image putting that in their issues, and having it at shows, and… who knows where it will go now. So, I’m excited, I think it’s going to have a life of its own. So it’s cool. There have been other movements to promote diversity in comics, like “We are comics”, or “Women read comics in public too”. Do you feel like, someday, this diversity will be acknowledged within the comic industry? I certainly would like to hope so; I think right now, we saw the problem. I’m not going to get any of my statistics, here, correctly, so I’m not going to pretend I know them off the top my head, but all I know is that it is an embarrassingly small amount of black creators, I know it’s an embarrassingly small amount of Asian creators, I know it’s a very stupid, small amount of transgender creators, and I think our gay creators are even, like… I mean, the transgender and gay community in comics hardly exists, in terms of—I mean, there’s a lot of indie artists, and people out there who are hitting the bricks, as hard as they can, to put their work out themselves—but in the way of, like, Marvel or DC getting behind these talents, or hiring talents like that regularly… except for small things like Women anthology, which, I really like Women anthology, and I like annuals where they highlight women, but I’ve seen women get hired just for these anthologies at Marvel and never hired to do a book at Marvel, you know… So I appreciate—I think it’s a good intention, but I would still… I don’t understand why a transgender woman or man, or a gay woman or man, or just an Asian woman, hasn’t been given her own title yet, to go on for a whole year. So… I’d like to say it’s getting better, and I think, like the Eisner’s list this past year was embarrassingly lovely, it was just full of women talent, which was, I mean, huge, it’s great, um… so I think it’s slowly changing, but you still have a lot of men who are… and I feel, if you’re like one of these men, saying things like “I don’t see what the big deal is”, or “why are they so upset, if women don’t like it they should go do their own comics”, like, that’s not helpful to the discussion. It should be for everybody, because comics are for everybody, and… I hope it’s getting better. So I’d like to see people stretching out their comfort zones, because I think the sooner we have more books like Ms. Marvel, which was really out of left field, and was a huge, huge success for a reason… Saga, out of left field, huge success, and er… what’s the other one… what’s that book? The Wicked and the Divine! WicDiv celebrates a lot of diverse people—and these books are huge successes… and Kieron Gillen doesn’t just write the same people over and over… you know, G. Willow Wilson is writing something maybe close to her home, but it’s not something that we have ever seen before, and I think that’s very important. The more we see out there that’s not just the white man on a hero’s journey, not just that same concept over and over again, we’ll draw more and more people, and the industry will change, hopefully, behind it, you know? Again, sorry for a long answer, I get very excited! Any female writers whose work you’re following at the moment? Yeah, I think those are the ladies that really rev my engines, at least I get really psyched… but I’m often learning about new ones, too… anybody. And again—I want to see every type of minority out there, so that it’s no longer a minority, I want to see more… I wish I could name a gay writer, but I don’t know if I even can, cause there’s just so few of them in the industry… I wish I could just name a transgender writer, but I don’t know if I can. It’s… that makes me mad. Same with female directors, you can’t even name a whole lot of lady directors—I know Kathryn Bigelow is the biggest one, she’s my favorite, but it’s um… I want more. I would love for you to be able to say, “Jordie, who’s your fave…?”—I mean, not what we should be asking those questions hopefully in ten years, but like, you know, I would like to be able to name so many women, that we’d have gay women, and black women, gay black women, and like, all these different types… but right now, it’s like we have ten really great white lady writers. I want more. Just give me more! That’s it. More.